The Palestinian Authority and the international community made a PR spectacle out of Khan Al-Ahmar and its impending demolition. Suffice to say that when facing human rights violations which are listed as war crimes, protocol is given precedence and the media follows suit. Two recent statements testify to this collective experimentation upon the Palestinian people. The International Criminal Court (ICC) prosecutor warned that Khan Al-Ahmar’s demolition would constitute a war crime under the Rome Statute. Fatou Bensouda will, she added, “continue to keep a close eye on the developments on the ground.” It is worth noting that the situation in Palestine has been under preliminary investigation at the ICC since 2015 and the rhetoric remains stagnant in concordance with the bureaucratic procedures that allow war crimes to be committed rather than prevented. Meanwhile, PA Prime Minister Rami Hamdallah paid a so-called “solidarity visit” to the threatened village in which verbal distinction between the people and the politicians was blurred. “Our presence here today in Khan Al-Ahmar carries a message that says we are going to fight to defeat the deal of the century,” Hamdallah declared. Whose presence was he referring to? The PA’s presence is a symbol devoid of any symbolism, diplomatic or otherwise; it’s an authority without authority. There will be no official PA presence in Khan Al-Ahmar when the Israeli bulldozers roll in and rhetoric about fighting the deal of the century will be spouted forth at another opportune time and place. While the fate of the Bedouin village has indeed attracted international attention, there is a constant failure to note that all such forced displacements from 1948 onwards are part of Israel’s plan to colonize all of historic Palestine. The insistence on framing this eviction as detrimental only to the two-state compromise is not only inaccurate but also dangerous. To what extent is Khan Al-Ahmar important to the international community? Is it because there is a commitment to uphold human rights — if so, why are they not being upheld? — or is there some value to be derived from maintaining the clearly obsolete two-state rhetoric? It is not difficult to guess that human rights have little to do with what is happening. This should prompt collective outrage at the international community’s own abuse and exploitation of Palestinian rights depending on whether they concur with the accepted paradigm. The PA and the international community have tethered Palestinians to future hypothetical support. 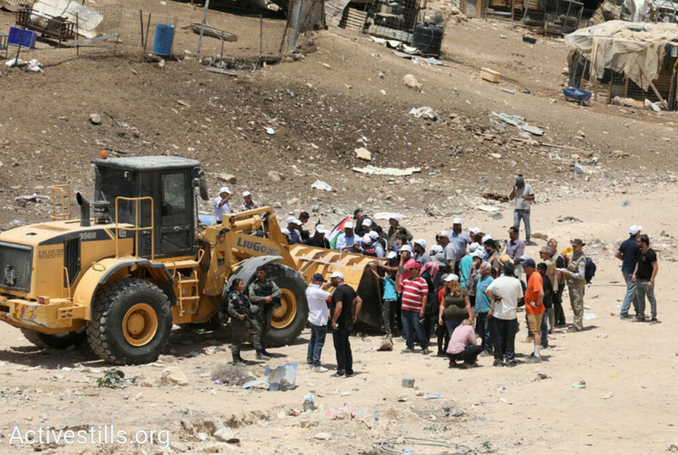 Furthermore, there is an adamant refusal to view Khan Al-Ahmar’s demolition as another macabre chapter in a long history of forced displacement of the Palestinian people. Historically, the villagers’ struggle is not unique, yet we are forced to view it as an isolated incident. The difference lies beneath the perception. Palestinian communities targeted with forced displacement are aware of their solitary predicament in relation to the political unraveling of their cause. The PA’s alignment to Israel and the international community, on the other hand, leaves it with little choice other than to continue the charade of allegedly protecting Palestinian rights while failing, more than ever, to find a foothold for its survival beyond what is dictated to, and implemented by, itself as an institution created to defend Israel. Like the international community, PA officials have attempted to tie Khan Al-Ahmar to the two-state delusion in vain, while the community has persisted in its resistance within the framework of historic Palestine. 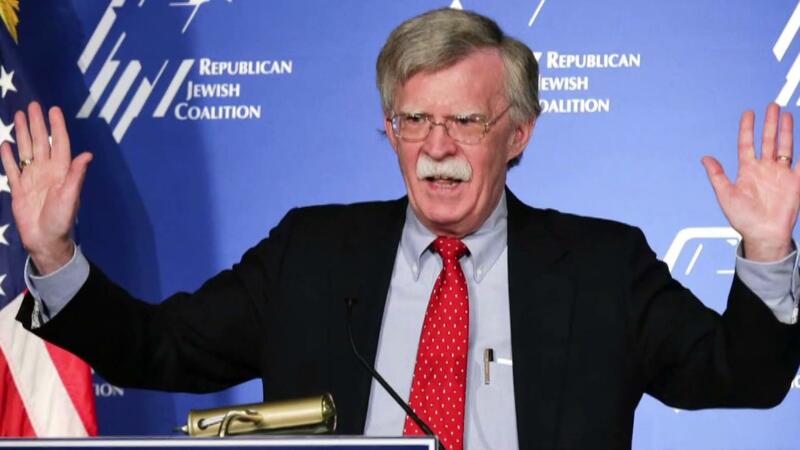 White House National Security Advisor John Bolton branded the International Criminal Court dangerous and unaccountable Monday, saying it constitutes an assault on US sovereignty. “In theory, the ICC holds perpetrators of the most egregious atrocities accountable for their crimes, provides justice to the victims, and deters future abuses,” Bolton said. “In practice, however, the court has been ineffective, unaccountable, and indeed, outright dangerous,” he said. The US State Department confirmed Monday it was ordering the closure of the Washington mission of the Palestinian Liberation Organization, saying the Palestinians were not supporting ‘peace’ talks with ‘Israel’. 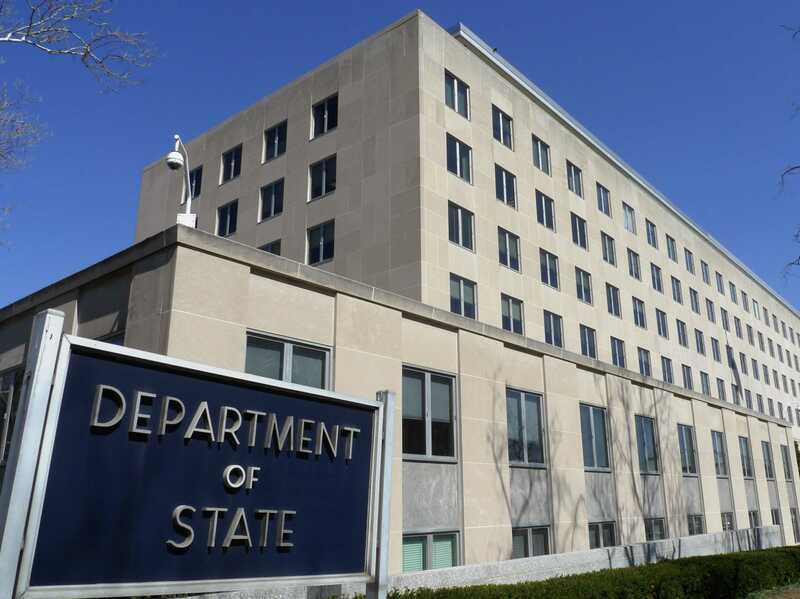 The Palestinian government condemned the US administration decision to close the headquarters of the Palestinian mission in Washington, describing the move as a declaration of war. The spokesman of the Palestinian government Youssef Al-Mahmoud stressed that the US decision would not be able to impose on the Palestinians the formulas which eradicate their cause, calling on the whole world to confront those new imperial policies. The United States has decided to close the Palestinian mission in Washington in the latest move against them by President Donald Trump, a Palestinian official had said Monday. 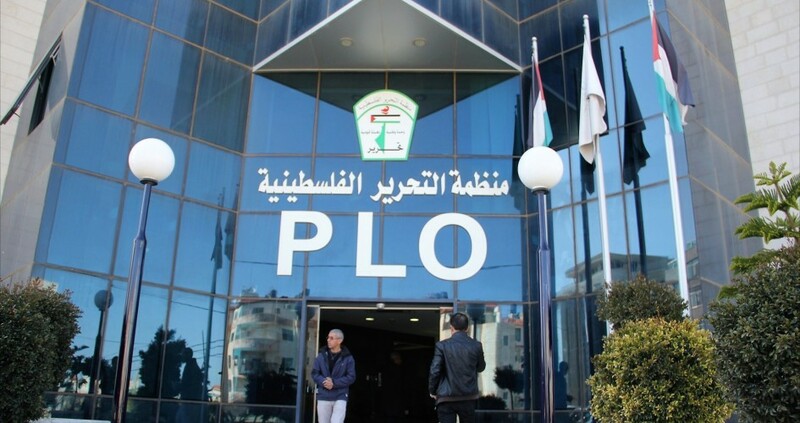 “We have been notified by a US official of their decision to close the Palestinian mission to the US,” Palestine Liberation Organization secretary-general Saeb Erekat said in a statement. Donald Trump will unveil his new Middle East (ME) peace plan in mid-to-late June after the end of Ramadan. The exact date for its publication is yet to be announced. Select allies are already being briefed on the elements of the plan. US Ambassador to the UN Nikki Haley has confirmed that the initiative is being finalized. The details are not yet known, but it is generally believed that the proposal will suggest recognizing Israel as the Jewish people’s homeland. The Palestinian Authority (PA) will be given limited sovereignty. Its territory will include about half of the West Bank, including the Arab neighborhoods of East Jerusalem and the entire Gaza Strip, provided that Hamas agrees to disarm. The Jordan Valley will go to Israel, preserving its security presence along the Jordan River. The Old City will also become a part of Israel. Palestine and Jordan will share religious jurisdiction over Jerusalem’s mosques. Abu Dis, located in the eastern part of Jerusalem, will become the capital of the PA. Israel will be responsible for the West Bank and the security of the border crossings. A system for compensating Palestinian refugees will be established and managed by the international community. Their right to return will not be recognized. The plan will not be presented as a definitive document, but rather as the springboard for generating the momentum to rush into broader negotiations with the leading Arab actors, such as the Persian Gulf states and Egypt. The expectation is that certain mutually acceptable ideas will be discovered that will get the ball rolling. So the proposal is not a two-state solution, but rather a blueprint offering a smorgasbord of options for further talks. The plan is expected to be rebuffed by the PA amid signs that the US may slash funding for the West Bank and Gaza. The funds are likely to be reallocated elsewhere. Washington and its allies are looking for prominent Palestinians who would agree to back this plan that is certain to face rejection from the president of the PA. Mahmoud Abbas. Progress on the Israeli-Palestinian track is a must; otherwise it’ll be a tall order to establish an anti-Iranian coalition that includes the leading Arab states. Saudi Arabia and other potential members of such a group cannot openly cooperate with Israel. The Palestinian problem is an obstacle. The US needs to marshal regional support for this plan. We’re going to start seeing some very intensive diplomatic efforts, including behind-the-scenes meetings. The plan will be inevitably rolled out at an international conference, probably hosted by a large Arab nation, such as Egypt for instance. As mentioned above, many US presidents have tried to find a solution to the ME conflict. Trump’s plan stands out as an initiative not aimed at bringing the two sides to the negotiating table but rather one that exerts pressure to make them accept it. Resolving the Palestinian issue paves the way for uniting a powerful coalition under the US banner. Another hallmark of the plan is the attempt to find an alternative to the current Palestinian leadership. Finding the right people is part of the effort. The US position in the region was weakened as a result of the decision to move the embassy in Israel from Tel Aviv to Jerusalem. Leading the peace process will get the US back onto the field as the leading player and an indispensable nation in the region. With an anti-Iranian coalition in place and moves underway to roll back Tehran, China will suffer and find itself growing weaker. The rise in global oil prices will make Chinese commodities more expensive and thus its exports will become less competitive. The growth of its GDP could slow as a result. Russia has the reputation of being an “honest broker” in the ME and its regional influence is on the rise. Keeping Moscow out of the Israeli-Palestinian negotiation process is one way to contain it. And in the end, the Palestinians will actually gain nothing. The proposal appears to be highly favorable toward Israel and dismissive of the PA. With Israel retaining control over security almost throughout the Palestinian territory, no full sovereignty is possible. The PA’s borders would not be based on the pre-1967 demarcations as the UN resolutions demand. But Sunni Arab states and others would provide enough economic assistance to the Palestinians to make them pliable. Donald Trump likes to make “deals.” Perhaps he views the Palestinian problem as essentially an economic issue, not a political one. Because of this perspective he has adopted a “you make concessions to get economic benefits in return” approach. The problem is with the PA’s leadership, which is headed by Mahmoud Abbas, its people, and also the Arab leaders who want a real political settlement instead of a trade deal, because they aren’t going anywhere. It’s really hard to imagine the Palestinians taking any offer of “limited sovereignty” seriously. The Israeli-PA conflict is not a problem to be tackled by a club of the chosen. Any peace effort requires broad international representation. The Palestinian leadership insists that Russia and a number of other states and organizations take on the role of mediating such a multilateral peace process. President Trump’ proposal hasn’t even been made public yet. Nothing official has been heard from Washington so far. But some experts believe that the plan is dead on arrival. Perhaps they have a good reason to think so.